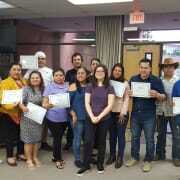 LIFT is seeking adult volunteers to help teach English as a Second Language (ESL) to our adult learners. Classes are taught in English, so no foreign language skills are required. No previous teaching experience is required. LIFT will provide teacher training. Classes meet from 6:30 to 8:30 p.m. on Tuesdays and Thursdays at St. Luke's Catholic Church, 1015 Schulze Drive in Irving. Volunteers are asked to commit to 3 hours (1 hour of prep time and two hours of teaching) per week for 12 to 14 weeks.